Day 3 dawned with some great weather & beautiful clouds over the volcanoes around us. After the usual fruit and omelettes for breakfast we were off to our first school of the day, St Pierre Nyanga. We had a thorough plan of how to co-ordinate the sessions for about 150 primary school aged kids. As we set up our different exercises we realised that it could be more than that. In fact the final count was 400! This is where our local coaches really came into their own too as the younger kids struggled with English. Joseph, Emmy and our driver Stephen did an outstanding job rotating between groups to translate. So it was time to innovate. When you suddenly have 70 kids per group rather than 30, your Cricket Without Boundaries Training kicks in & you improvise. The focus becomes to make sure the kids are having some serious fun and that the key Abstain, Be Faithful, Use a Condom & Get Tested (ABCT) messages get across. This the team did with great aplomb and at the end of the first session we had several hundred kids running across the field chanting the ABCT message with accompanying sign language, an amazing experience. Next were their older brothers and sisters from the senior school. A mere 170 this time. I was on bowling duty with Alex & Nick and was really impressed by the progress you can make with a group 30 kids. From throwing the ball all over the place they graduated to bowling with straight arms to each other and at the wickets in about half an hour. Based on this evidence Rwanda could be an ICC trophy contender in a decade! After a quick lunch of rolex – an omelette wrapped in chapati – 4pm we drove an hour to our afternoon destination, 30 minutes of tarmac followed by another 30 of truly bone shaking terrain. The drive was more than worth it. 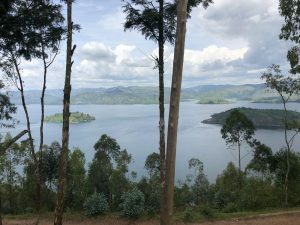 I’ve been blessed to visit Africa at least a dozen times in the last 30 years and I’ve rarely seen a view like this, across a lake with some gorgeous islands and across to Uganda. This was the standout experience of the trip so far. We met great set of teachers at the Mwiko school including a Maths teacher called Patrick who had written tips on cricket all over his blackboard following his CWB teacher training yesterday. 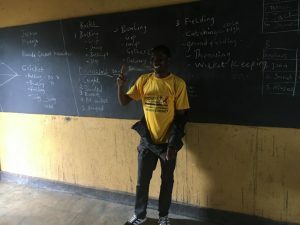 The kids were just remarkable – whether playing rapid fire in the quarry area above the school or filling in posters about cricket and HIV/AIDS. So energised by the scenery & experience were we that we walked part of the way back to the main road home, just to drink in the experience and chat to the teachers and kids that were homeward bound. Over 1200 trained so far in the last 2 days. Here’s to the rest of the fortnight!